The Garden of Surging Waves features many pieces of artwork that not only help tell the story of Astoria's Chinese immigrants, but also impart a deeper understanding of Chinese culture and tradition. The pieces were commissioned from Shaanxi Yuan Kun Sculptural Arts Company in Xian, China, and arrived in Astoria in the fall of 2010. The Moon Gate is a traditional architectural component in Chinese gardens, and functions as the spiritual and physical entry into the garden. Inset into the rusted steel structure of the Moon Gate is a series of hand-hammered bronze panels depicting traditional Chinese landscape paintings of villagers nestled within mountains, streams and clouds. The top panel features the Chinese name of the garden, Cāng Láng Yuán (hear the Chinese pronunciation). A pair of northern lions in cast bronze guard the garden entrance. The tradition of placing lions at the entrance to a structure dates back to the Han Dynasty. It is believed that lions posses mythical powers that will protect the people and structures that they guard. 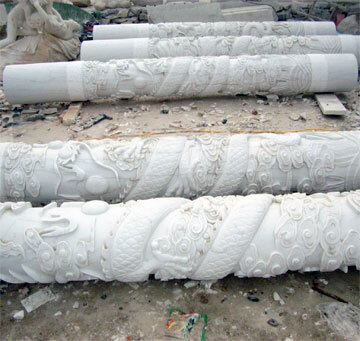 Eight majestic granite columns are individually hand-carved with mythical dragons nestled in traditional Chinese cloud and ocean wave motifs. These granite columns are juxtaposed with regional Pacific Northwest timber in the secondary columns and the roof structure of the Pavilion of Transition. The form of the Pavilion of Transition is an interpretation of traditional Chinese forms. The columns guard a salmon-themed lantern suspended over a mosaic pattern of sturgeons. The dragons on the columns, together with the dragon at the bronze lantern statue equal nine dragons in total – an auspicious celestial scene in Chinese culture. Three cast bronze scrolls traverse the Entry Story Screen, and depict three Chinese classics that emphasize Chinese teachings and cultural values dating to 500 BC. 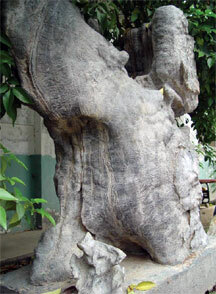 The 13-foot scroll records excerpts from Confucius' Lun Yu; the ten-foot scroll has quotes from Lao Zi's Dao De Jing; and the seven-foot scroll contains a segment from a popular 13th century nursery rhyme that is still used today. 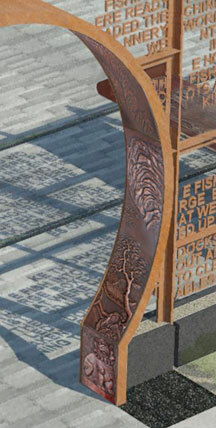 Timeline benches run the length of the northern edge of the garden and provide a visual representation of the history of Chinese immigrants in the Lower Columbia River Basin. Beginning with their arrival in the 1860s and spanning to present day, the timeline markers briefly summarize important historical events and significant milestones. The markers are spaced in chronological order according to their relationships to other events. 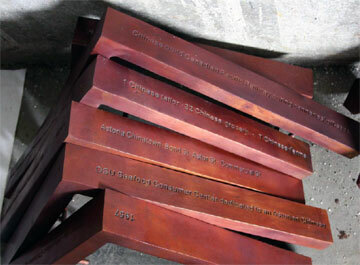 Each of the 24 cast bronze markers is unique in both content and shape. Mr. Huo Bao Zhu is known to Oregonians as the distant friend from China who gave Portland the majestic, six-ton statue of the bronze elephants in 2002. On Mr. Huo's first visit to Astoria in 2009, on a stormy day, he fell in love with the coastal town. With the warm welcome expressed by the Astoria Chinese Heritage Park Advisory Committee, the city council members and Mayor Van Dusen, Mr. Huo was moved to offer to the Garden of Surging Waves a large cast bronze lantern. 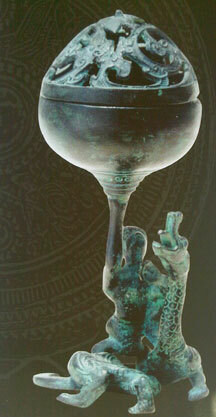 The story of the statue is as follows: “A fiendish mythical dragon stirred up the waves in the ocean. Using one hand the wise monkey stroked and calmed the dragon, the other hand held up an incense burner.” The cast bronze lantern, six-and-a-half-feet tall, is modeled after a ten-inch incense burner from the Western Han Dynasty, 204 BC.